Distracted Driving Summit: What to Do About Texting-While-Driving? Should Apple hobble FaceTime to battle distracted driving? In 2014, a driver using Apple's FaceTime video app allegedly killed a five-year-old child. The grieving family says Apple knew the danger, and even patented a tech to reduce risk, but still did nothing. Does Apple bear a measure of responsibility for the death of five-year-old Moriah Modisette? Her family think so. Moriah was riding in the family car near Dallas, Texas, when it was allegedly rear-ended by a man who admitted that he was distracted by using the iPhone's FaceTime video-calling app. The child was airlifted to a hospital but died that night — Christmas Eve of 2014. In a lawsuit filed in Santa Clara Superior Court late last month, the family charged that Apple knew FaceTime was potentially dangerous and had even filed a patent for a technology that prevents its use when a vehicle moves at highway speeds. Apple was negligent, the family claims, for not enabling the tech. "Lock out" tech was not in use when the driver slammed into Modisette's Toyota Camry and Apple still hasn't deployed it, though a number of third-party applications exist that serve a similar function. The driver, 21-year-old Garrett Edward Wilhelm, has been charged with manslaughter and is set to go to trial next month in Texas, according to a report in the Denton Record-Chronicle. You could argue that the fault is Wilhelm's alone. He did, after all, choose to use FaceTime on his iPhone 6 Plus while driving at high speed. No one, least of all Apple, made him do it. However, that begs the question of how the dangerous plague of distracted driving can be tamed. The year Moriah was fatally injured, she was only one of 3,179 people killed in accidents related to distracted driving in the United States, while 431,000 people were injured, according to the U.S. government's website on distracted driving. Smartphones had not yet become ubiquitous when Apple filed the related patent claim in 2008, but it was well aware that texting and similar apps could prove to be fatal when driving. The patent described a technology that would essentially disable FaceTime when a phone was moving rapidly in a car. "New laws are being written to make texting illegal while driving. 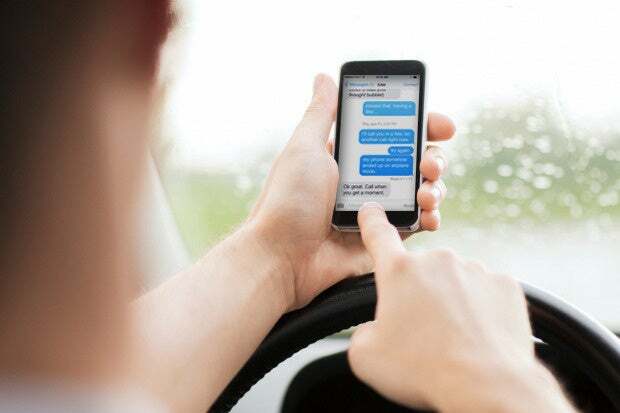 However, law enforcement officials report that their ability to catch offenders is limited because the texting device can be used out of sight (e.g., on the driver's lap), thus making texting while driving even more dangerous. Texting while driving has become so widespread it is doubtful that law enforcement will have any significant effect on stopping the practice." The basic functionality that would enable the FaceTime lock isn't new. The heart of any such device is an accelerometer, which measures how fast a phone moves relative to a fixed point. Apple, which has not commented on the lawsuit, and other technology companies maintain that lock out technology is flawed. It could, they argue, block the use of apps by passengers in a vehicle, and many consumers would likely resist it. But some such solutions are already in use. For example, a company called Cellcontrol sells a product that combines a smartphone and a small hardware device that senses when a car is in motion and blocks the use of distracting apps. The wireless industry is also well aware of the dangers of distracted driving. AT&T, for example, runs an anti-texting-while driving campaign called "It Can Wait," and Verizon offers several apps that block texting while driving, including one that notifies parents if their teenagers disable it. Given the enormous evidence that distracted driving is a public health menace, and the availability of technology to limit it, there's simply no excuse for Apple or any other device maker to sit idly by.